Above are the four children of Martin Luther King Jr. with wife, Coretta Scott King. They are from left, Dexter Scott King, Rev. 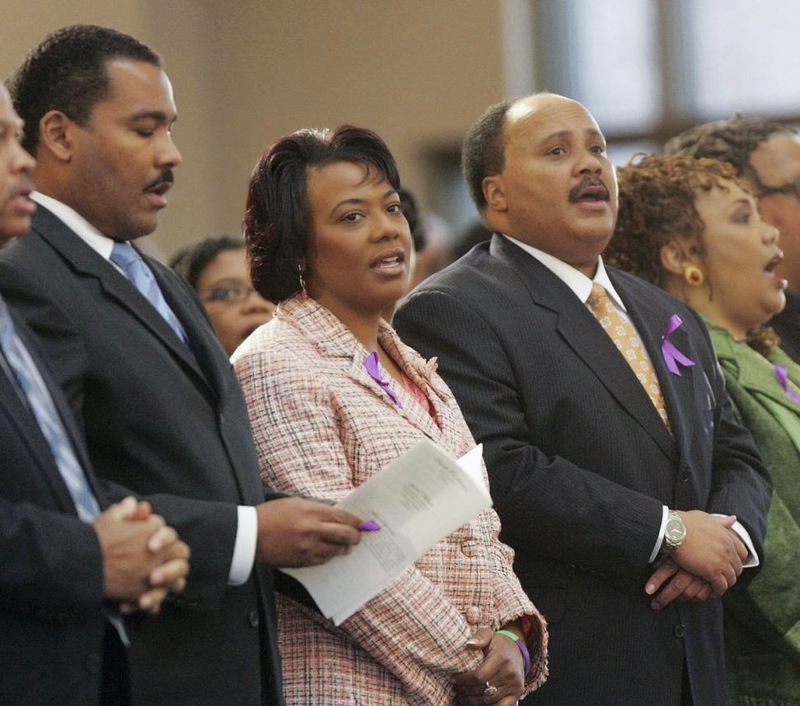 Bernice King, Martin Luther King III and Yolanda King. This picture was taken at a church service in Atlanta in 2006, but now all is not well in the family as the children are currently embroiled in a legal battle over their father's Bible and Nobel Peace Prize. The sons want to sell the items to raise money for their father's estate needs. The first daughter wants to hold onto the artifacts for their mother's estate. After seeing the SELMA Movie just a few days ago and marveling at the forgiveness that marked MLK's relationship with his wife, I find this petty squables among the children so saddening. King's sons Martin Luther King III and Dexter Scott King, who run the estate, are suing their sister Bernice to turn over the items. The Bible was used by President Obama during his 2013 inauguration. But Bernice wants to hold onto the historic relics - claiming their father gave them to their mother Coretta Scott King. When she died, Bernice controlled her mother's estate. Because of the disagreement, the bible and Nobel Prize have been turned over to the court and a judge will either rule on the ownership Tuesday or schedule a trial date for February. Bernice said in response to the lawsuit, according to the L.A. Times. "There is no justification for selling either of these sacred items. They are priceless and should never be exchanged for money in the marketplace.While I love my brothers dearly, this latest decision by them ... reveals a desperation beyond comprehension."